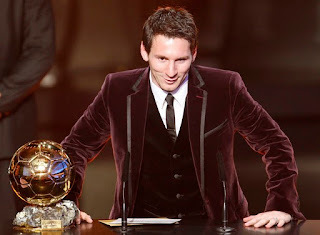 FIFA’s annual Ballon D’Or Gala took place yesterday in Zurich, Switzerland. It was a night to celebrate the beautiful games best and brightest, those who shone above the rest, and as always Lionel Messi stood out a little more than most. While donning a purple jacket, Messi graciously accepted the award which he pledged to share with teammate Xavi. Messi beat out Xavi along with Real Madrid’s Cristiano Ronaldo to win the award, and is already looking to be the favorite for next year’s Ballon D’Or. 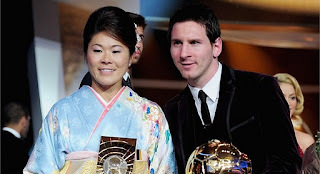 Honmare Sawa was awarded the Ballon D’Or for her efforts leading Japan to victory in the Women’s World Cup this summer. She edged out Marta who had been given the honor the previous five years as well as American Abby Wambach. Sawa is the first Japanese player to be given the honor, but it was not the only accolade that she would receive on behalf of her country. Japan was also awarded the FIFA Fair Play Award for the “impressive courage and spirit shown by Japan as they recovered from the terrible earthquake and tsunami that devastated large parts of the nation on 11 March 2011.” Both awards were truly deserved and Sawa received them both graciously on behalf of the Japanese Football Association. Neymar took home the honors for first ever Puskas Award for FIFA Goal of the Season for this masterpiece of a goal that was scored against Flamengo earlier this season. The 19 year old appeared in a more traditional tuxedo than Messi, but dazzled nonetheless thanks to his trademark orange mohawk, as he received the award from former Mexican striker Hugo Sanchez. Some would argue that the award should have gone to Hamit Altintop for his thunderous strike against Kazakhstan, but I’ll put them below and let you decide for yourself. To close out the ceremony, FIFA handed out its annual FIFA/FIFPro World XI awards to the masters of their respective positions. Iker Casillas, Dani Alves, Gerard Pique, Nemanja Vidic, Sergio Ramos, Andres Iniesta, Xabi Alonso, Xavi, Lionel Messi, Cristiano Ronaldo, and Wayne Rooney all collected their awards from Pele as they were honored as the world’s most elite.